Oscillographe (biology and medicine)- registration of the fluctuations of the electric potential in animal tissues with an oscilloscope. Oscillographe is applied to study the activity of the heart (see Electrocardiography), brain (see Electroencephalography), muscles (electromyography), registering vibrations of the walls of arteries, arterial oscillographe), etc. Fig. 1. 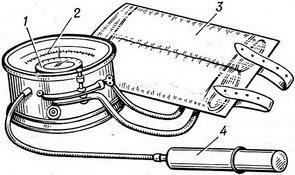 Blood oscilloscope: 1 - Pischik; 2 - cassette with the paper; 3 - rubber bulb; 4 - rubber gland in the case. Fig. 2. Oscillogram of a healthy person. Fig. 3. Membrane oscillometer: 1 - tonometer, showing the height of blood pressure; 2 - oscillometer; 3 - cuffs (upper and lower); 4 - pump. For arterial oscillography has found wide application oscilloscope type "red guard" (Fig. 1). 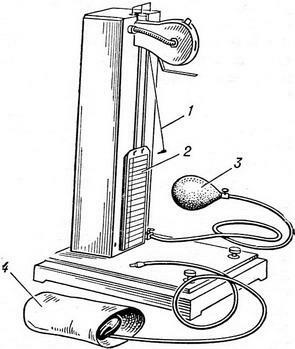 How it works is this: with the help of rubber bulbs pumps air into the system, pulsation of arteries limbs perceived cuff and results in the oscillatory motion of the diaphragm, which in turn drives the writing arm; the pen of the last records fluctuations on paper, fortified in the cassette. Obtained oscillography curve is called an oscilloscope. It reflects the state of the main (basic) of arteries limbs, located under the cuff, and indirectly allows to judge about the state of the overlying arteries (subclavian, axillary, iliac, the bifurcation of the aorta). Oscillography produces average health worker, conclusion on the oscillogram gives the doctor. The study was conducted in a warm room, with the patient lying. The recording is done alternately with symmetric parts of the limbs. If oscillography the lower third of the thigh cuff impose above the knee, forearms under the elbow joints, lower third of the shoulder above the elbow joints, legs - in the lower and the upper third. The cuff should not impose tight: with the correct overlay under it should feel free to approach your index finger. In the cuff pump air to termination under it pulsing arteries, and then start recording oscilloscope. Then open the crane in a pear and gradually reduce the pressure. 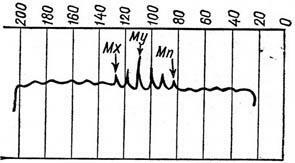 The first pulse wave waveform revealed distinct tooth directed upwards,- maximum blood pressure-MH (Fig. 2). At lower air pressure in the cuff amplitude of oscillations of teeth waveform increases: the highest wave, called oscillographic index (RI)which corresponds to an average blood pressure (My), which is constant for each person. Further reduction of pressure in the cuff reduce quantities of teeth, waveforms, and her last prong shows the minimum blood pressure (MP). Status pulse fluctuations of the arteries and blood tone can be judged according to oscillometry (check pulse fluctuations artery on the scale of oscillometer, Fig. 3). Oscillography and oscillometry held in congenital and acquired malformations of the large arteries, to reveal hidden hypertension.